Mercedes unveils new M-Class | What Car? This is the new Mercedes M-Class. It's the third generation of the 4x4, it's 25% more fuel-efficient than the current model and it will go on sale in the UK next year. Visually, it stands out from the current car thanks to its redesigned front end. This incorporates a new-look grille, with new headlamps and daytime running lights in the bumpers. On the exterior various chromed parts give the car a high-quality look, while the cabin can be trimmed with aluminium highlights rather than the more usual wood finishes. The dash is designed to give a 'wraparound' feel, but Mercedes says the cabin is more spacious and comfortable than the old model's, and has more user-friendly controls. As before, the M-Class will have permanent four-wheel drive, but the engine range is all-new. In the diesel line-up, the old six-cylinder ML300 CDI is replaced by the four-cylinder ML250. This has the same power as its predecessor, but much better economy and lower CO2 emissions - 47.0 mpg and 158g/km. The new ML350, likewise, has better economy and emissions than the version it replaces, as well as better performance. 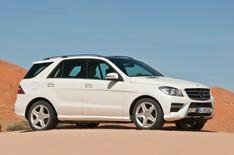 The same is true of the new petrol-engined ML350 Blue Efficiency, which outperforms its predecessor in every way. To improve the way the car drives, every model will have selective damping. The company says that the shock absorbers give a soft ride in normal driving, but stiffen up in hard driving or emergency manoeuvres. ML350 models also have features to improve their performance off-road, with a further optional package, called On&Offroad. This allows the driver to choose from a series of modes to suit where and how the car is being driven. Mercedes says that, as well as being more refined and comfortable than the current model, the new M-Class is also safer. All models have front, side and curtain airbags, with the option of side airbags on the rear seats. Beyond that, extra features include drowsiness-detection and tyre-pressure-warning systems. Among the options will be Mercedes' Lane Keeping Assist, Blind Spot Assist and an enhancement to the standard Pre-Safe system, which will automatically apply the brakes to try and avoid an accident. Final prices and specifications for the UK are still some way from being confirmed, but the car will go on sale in spring 2012.